Hello and welcome to episode 19 of Coexisting With Nonhuman Animals. Martin also made the "Vegans against PETA" logo that I have on my blog. This episode I'd like to talk more about the recent cases of "animal cruelty". Of course, this is not about how we treat cows or chickens or sheep or pigs, its basically a few incidents of people hurting or killing dogs and cats, although also birds in a clip I'll play. The media of New Zealand have been covering all the incidents of cats and dogs that have been hurt or killed, and recently, a law about "animal cruelty" has been changed to be harsher towards offenders. There have been many bizarre acts mentioned, dozens of dogs slain by a couple angry men, heads snapped off pets and the like, but never any mention of how we treat farm animals of course. Some of the most vocal people calling for increased fines and jail time will most likely be nonvegan, which is just bizarre. 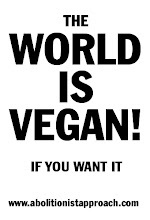 To claim that animals deserve to be left alone, without being hurt, and then to sit down to a nonvegan meal, while wearing their skin and wool is very misguided. Celebrities have appeared on television talking about "sticking up for animal rights" and the like, even very manly men are meant to get behind the campaign. And yet, if I mention farmed animals being killed for our food, clothing and other uses, I'm being "radical". I'll play the Sunday show now. I'll warn you, during the piece, a blurry video was shown of a pitbull eating very small kittens. This was shown on television, and I think a lot of people will be very upset by this. I guess its nowhere near as bad if you just hear the audio, you really only hear the owner telling the dog what a great job its doing. Despite this, the man who encouraged the dog calls himself an animal lover, he grew up on a farm. I felt like I should warn you, I've built up a callus from watching violent video and hearing dramatic audio, but I understand and respect people who get very upset about seeing or hearing these awful acts. This was played on mainstream television, and I dont think I'm pushing the boundaries of whats acceptable by leaving this part in the Sunday show clips. Personally, I was more upset by a second part of the video, where you see footage of exotic birds that have been brutally killed. A bunch of men had broken into a public aviary, and killed all the birds they could by snapping their necks. We hear the men being asked how they did it, and they say the same way you would do it to a duck, which is curious. If you do it to a wild duck, its absolutely fine, but if you break into a public aviary and "destroy public property", you are an inhuman monster. We hear of a cockatoo that had been very friendly, and more than once we see its corpse, contorted in what looks like great pain, the cameras go past a sea of brutally abused birds. I can only imagine what it would have been like while the birds were being hurt, I imagine they would have been flying around and around their caged prison, while the men grabbed and broke them in any way possible. There would have been no escape, and in the end, they are shown lying on the ground, birds of every colour, size and shape, lying broken. The man accused of feeding cats to his dog seems genuinely sorry in the SUNDAY interview, he has tears streaming down his face, but there seems to be little doubt about what he did to those animals. After I play the clips, I'll talk about how many people have responded very harshly to "animal offenders", I'd like you to think about how you personally feel these people should be treated as you hear the clips. I'll play the SUNDAY piece now. It seems that one of the current news stories for the last few months has been about cases of Animal Cruelty, and a law has just been passed for harsher sentances on "offenders". Its odd isnt it, as soon as this law is coming up, the media seem to find a never ending list of the cruelest acts performed on animals that you could every think of. Except, the 56 billion land animals killed each year, statistics from the UN, to consider what happens to those objects owned by a farmer as the same as when 32 birds in an aviary are killed....thats being "radical" and "fundamentalist", not to mention "divisive". I think that making maximum jail terms, or fines, larger, will do nothing to help the animals and little to deter the people who seem to infest New Zealand at the moment, if all these reports of cruelty to cats, dogs and birds are as common as they sound. I imagine these people feel they are above the law, that they will never get caught, so why would they worry if the potential punishment is moved from 1 unit of jail to 1.5 units of jail? If we talk about fines, it already seems to be that young people who get outrageous fines, mostly for speeding and car related events, just have the massive charges that could never ever be paid back, wiped clean. I'm talking about people who supposedly owe the country hundreds of thousands of dollars, while in their late teens, and that figure of money gets deleted from a spreadsheet if they spend a couple hours doing community service, picking rubbish off a highway, for example. I'd sure like to be paid thousands of dollars per hour for menial labour. I'd like to replay comments from the Sunday show, how two elderly people felt about the aviary killings. These two seem like fairly average senior New Zealanders, I'd wager they are not vegan, and yet they are furious at the people who killed 32 birds. I think that mindset is very dangerous to have, to have these cases of shocking animal harm brought up, and then for angry lynch mobs to form, and to seemingly demand shocking harm to be done to the offenders. I also think its impractical, the two men who killed 32 birds, how are you going to kill them 32 times each? Certainly, if you only killed each man 16 times, thats easier than 32 times each, I guess, but still, you cant kill someone more than once, and I dont agree with that in the first place! What these people did to animals can never be undone, no matter how cruel you are to them afterwards. I'd think that by being brutal to prisoners, the whole country would be diminished, we would all become harsher people if we grew to accept brutal quote "payback" for offenders. I think we need to change how people feel towards all animals, we need to put chickens, cows, sheep, pigs and all other farmed animals into the same "untouchable" category as cats and dogs, and to not have them as property in the first place. I often listen to audiobooks and podcasts while I work. Here are a couple of clips from a "Horrible History" book about the second world war. This part is about the "town and country divide"
and another part about food shortages, and a mention of how the German people were said to not have meat at all. I think most people know how meat is "made", or should that really be, how the animals are unmade. But, we put up barriers and it can be quite difficult to get people to watch slaughterhouse footage. So, we might get told its "natural" to eat meat, but many people dont want to actually see how their food is killed and sliced up for them to buy in a clean plastic packet. How "natural" can it be, if you want to ignore all details of where it comes from and what happens to the animal? We also need to show that theres nothing radical about vegans, and that we are very healthy, and very happy, regular people. I'm certainly not green, at least in colour. I think that by taking a firm vegan stance, we can help promote the belief that all animals deserve to be recognised as belonging to themselves, that they are their own persons, we shouldnt own them, and certainly, whenever possible avoid harming them. In my show notes, I'll link to a story about an italian food writer who mentioned that cat meat is "succulent" and that many times in his life, he had eaten cats. You can watch the video clip on the linked Times Online page. There of course, has been a lot of talk about this comment, and the food writer was stood down. Imagine if we felt this way about eating chickens, eating cows, eating pigs, and all other animals we currently farm. If we can recognise that cats are "too special" to kill and eat, that we could never promote eating "free range cat", then we should endorse not using any animal.